Mill Valley, CA. 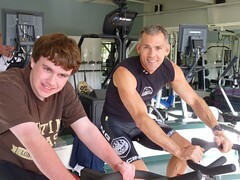 April 13, 2010 – The owners and staff of Body Image Personal Fitness Center are spinning their wheels to support a vital new program for local youth and adults on the autism spectrum. Join them on Sunday, April 25th, for a Spin-a-Thon for Autistry Studios from 10a.m. through 3 p.m.
Ian’s parents, Dan Swearingen and Janet Lawson founded Autistry Studios to help teens and young adults on the autism spectrum become successful independent adults. 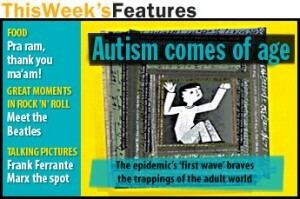 “There are many programs and services for young children with autism,” says Janet, “but there are very few for teens and adults.” Their unique approach is generating a great deal of excitement as agencies across the nation search for ways to help this ever-growing population. 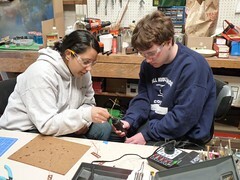 The program offers Build Stuff and Filmmaking Workshops, where participants strengthen their social, academic, and work skills as they complete projects of their own design. Dan and Janet also provide college support. The Spin-a-Thon is a series of five 1-hour spin classes led by Body Image instructors. Michael Lopez will lead off the day at 10am followed by Duncan Binihakis, Jen Ogg, Yasmine Shamsian, and Autistry’s own Dan Swearingen. Suggested donations are $40/hour for adults and $20/hour for teens (13-18). All proceeds go to the Autistry Studios Opportunity Fund to enable lower-income families to join the program. To register call: (415) 945-9788. 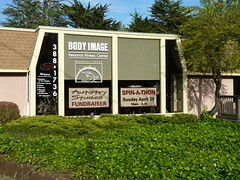 Body Image Personal Fitness Center is located at 25 Reed Blvd, Mill Valley. It’s Spring Break! There will be no workshops this week as we all take some time to relax and catch up on our reading, house cleaning, and other fun stuff. NEWS FLASH: We’ve been invited to present a 45 minute multimedia ‘poster’ session – Supporting ASD Youth in Transition: The Autistry Studios Model – at Michelle Garcia Winner’s Social Thinking Providers Conference in June. She had lots of applicants so we are thrilled to have been asked. The event will be Saturday, June 26th. We’ll send out more info closer to the day. SPIN UPDATE: The Sunday, April 25th Spin-a-Thon fundraiser for Autistry Studios is just 2 weeks a way. The first hour, 10am – 11am taught by Michael Lopez is now full. There are still bikes, treadmills and ellipticals available in the other classes. The funds raised will be used in our Opportunity Fund which allows us to offer services on a sliding scale to lower income families. Friday College Support and Build Stuff with Dan: Corey, Sarah and Ross joined Janet and Nate for a presentation to Pamela Wolfberg’s Autism Spectrum Program. We spoke to 30 graduate students about Autistry Studios and what it’s like to live on the spectrum. It was a great experience for us and for them! And a lot of progress was made on projects this week. Sarah finished Hugo’s dog bed – we are waiting for photos of him curled up on his plush cushion. 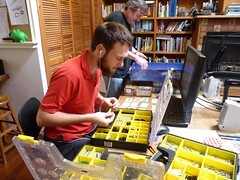 Ross sorted hundreds of Lego Mindstorm pieces into bins ready for assembling the robot. Corey airbrushed a first coat of paint onto the Scooby-Doo van. Kris applied for a job and applied paint to the tank. Saturday Film Stuff with Nate: Devon animated her character Kuro using Anime Studio 6. She really challenged herself to learn the new software but she got Kuro talking. Steven has a few more drawings to do and then his characters will be ready to join Kuro. Andrew has finished the foundation structure for his roadside diner diorama and will be cutting the planks for the walls soon. Owen, our latest Autistry recruit is proving to be our most prolific. He has made hundreds of drawings for his epic piece, Party in Fizzletown. Sunday Build Stuff with Dan The trains are now running on Ryan’s layout. He finished the wiring and is now ready to create the scenery and some buildings. Ian, with a bit of help from AJ, created 6 copper wire martial artists. 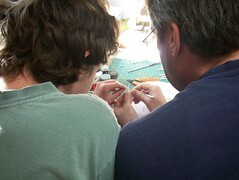 They are now working on the uniforms (gis) and belts which they will do in clay. 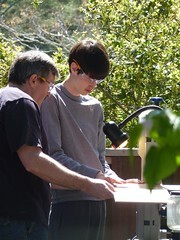 Sawyer built the walls on the citadel of his fantasy world – it is really taking shape. 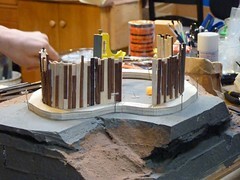 The diorama is based on a world of Sawyer’s creation and the construction is his own design! Tuesday Build Stuff with Dan: Rinny finished principal photography for her project and will begin editing at our next workshop. Breton is planning the last details on Elf World and will be finished in the next few weeks. 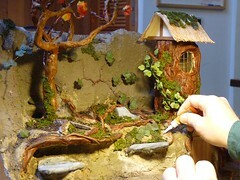 Erik painted the foundation of his historical Sausalito diorama and experimented with cement casting. Janet experimented with a new recipe for gluten free, dairy free, vegetarian, mushroom burgers. The result was very sloppy Sloppy Joes! Hope you all have a nice Spring Break! The Friday, April 9, 2010 issue of the Pacific Sun has a cover story about Autism written by one of our student’s parents, Linda Xiques. 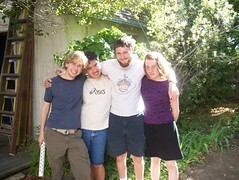 It discusses parents and their children who are part of the wave of ASD youth in transition to adulthood. 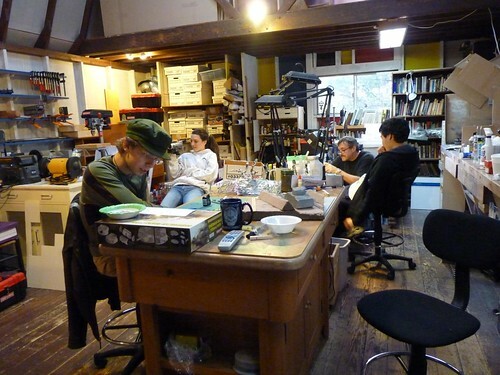 Janet and I are interviewed discussing our motivations and goals in designing Autistry Studios. 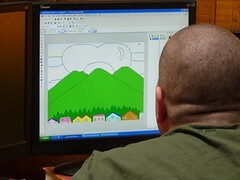 A high quality PDF of Autism Enters Adulthood with pictures. We would like to thank the Ryder Foundation for giving us a significant donation for 2010 to fund training additional therapists and aides working with students in our program. The Ryder Foundation provides funding to organizations that research the environmental causes of autism and effectively treat afflicted children. At our home and the homes of many families every day is Autism Awareness Day. Who could not be aware of the joy and the stress of living with someone on the spectrum! Joy and stress – most times in equal measure. The joy of viewing the world from a new perspective, of experiencing true unconditional love, of having a teenager say “Mommy I love you” in a crowded store with no concern for what others might think. And the stress – what does the future hold, who will be there when I’m gone? In order to create an environment where joy can flourish and to answer the dilemma of Ian’s future we started Autistry Studios. It is our dream to nurture the growth of a community that will accept and embrace our son and all those on the spectrum, a community where all our talents and skills are celebrated. April 2 is World Autism Awareness Day and we can think of no better way to celebrate than to kick off another weekend of workshops! 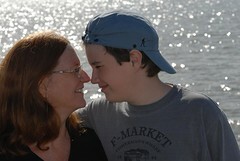 For our family, autism has meant finding a different path from where we expected to go. School is different. Birthdays are different. Puberty is about the same! The future is even less well known. But we are not alone and autism has connected us to our community in ways we never expected and in those connections lie the keys to a secure and happy future for our children.